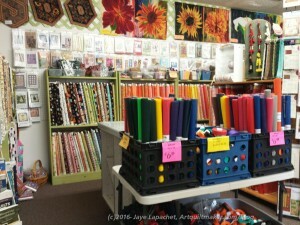 I know you must be exhausted by all of these quilt shops. I know I was by the time I got to the Rabbit Hole. I almost bailed on this shop, but since it was on my way I decided to stop in. Definitely worth the stop! 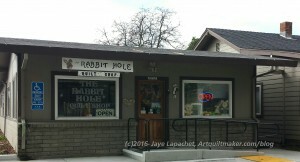 The last shop I visited was called the Rabbit Hole and the name was very apt! As I went into each room in the shop, I found another behind it. 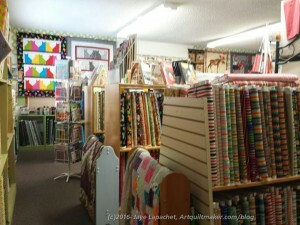 As I said, I was tired by the time I got to this shop and couldn’t focus as well as I would have liked, but I could focus enough to see that they had A LOT of fabric. 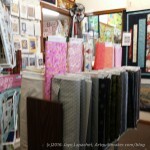 They also had a ton of panels, so if you are looking for panels, give them a call or stop by. Those flower panels might make an excellent One Block Wonder a la Pam’s piece and my Peacock. 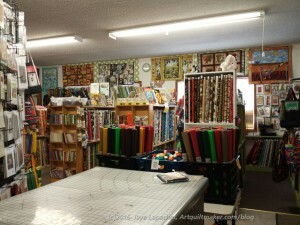 I couldn’t believe how crammed this place was with different types of fabric – lots of quilting cottons, certainly, but also net mesh, wool, etc. As you can see on the photo, they have a lot of patterns as well. I was impressed with the number of novelty prints and stripes. It made my head swim with the possibilities of pillowcases, but I reined myself in and turned away from them. I still have a few pieces of Christmas fabric I can use to make pillowcases. I didn’t recognize a lot of the fabric, which tells me that they have a different eye than I am used to seeing. This is probably why this shop is successful with another shop a couple minutes away. You can see how large the room is and this is just one of about 4-5 rooms of fabric. Cutting tables were scattered throughout the shop. The one in the phone (right) was in the very back of the store. I was a little surprised to see as nobody was in the shop except for me. I learned the reason for its placement when a large group of people (yes, there were some men!) came in the shop and filled the place with chatter and laughter. I had been there about 15 minutes and was wondering how much fabric they could move. I had my answer! 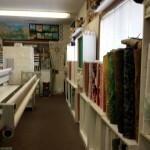 I think the newer fabrics were in the front of the shop. 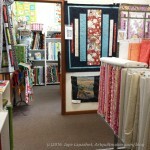 These rooms were small and there were several bolts of Asian style fabrics as well as projects made with them. The second room (through the doorway in the above left photo) also had baby style prints – soft colors, Minkee (or similar). 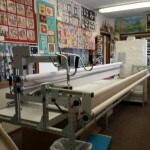 The shop also had a longarm and that room was not free from fabric either. A lot more panels were hanging in this room as well. I headed out after this shop and went back to the hotel and to my Political Wifery duties. It was a somewhat rainy day, but it made for beautiful clouds. 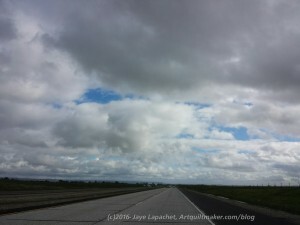 See part 1 of this travelogue. See part 2 of this travelogue.